Are you ready to quit smoking? This process includes a lifetime service guarantee, which means if you ever smoke or have a craving to smoke, just call or schedule online, and I will see you again for free. How can I afford to give away free sessions for life? Only 5 - 10% of our clients ever require a second session. First we will talk. I will explain every step of this process to you before anything happens. I care about your well being, and I want you to understand the science of how and why this this process is so effective. You feel completely comfortable, and excited to begin. Next I will work with your neurological system for about 15 minutes. It is your system that wants to keep you smoking just the way you are right now. 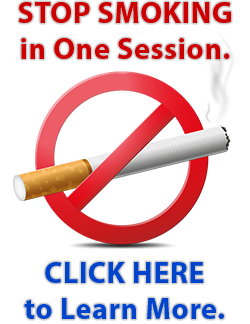 Your own body will indicate that the problem has been cleared from your system, and you will be a non-smoker before you sit in the chair for the advanced hypnosis. Should you have questions about my reputation, I simply encourage you to Google me. I travel around the world, and my training programs have been access worldwide. In 2017, I delivered the keynote address at nearly every North American Hypnosis Convention, and I was awarded the title of "Hypnotist of the Year." We will address your old smoking habit from all angles. 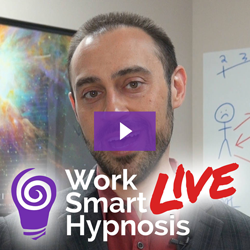 You will experience a wonderful hypnotic process that has been tested and verified to have a 95% success rate in trials. You will sit in a comfy recliner, and it will be just like listening to me tell you a story. You will not fall asleep. You will be completely in control. You will remember everything clearly. Do you have questions? Click here to schedule a time for me to call you.